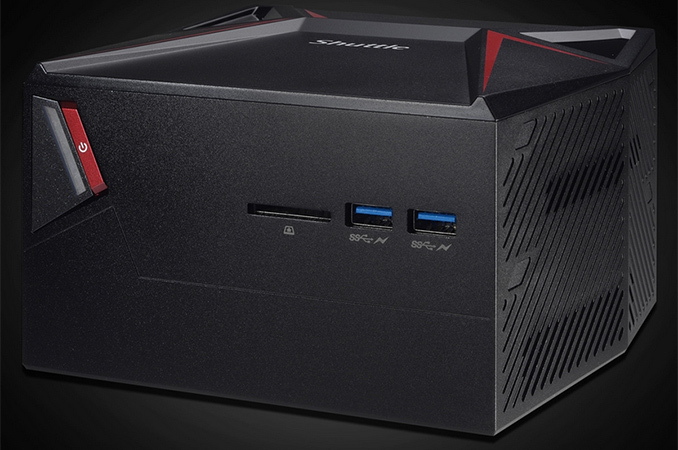 Shuttle has started to sell its new Gaming Nano family of small form-factor PCs. The miniature Shuttle X1 systems are barely larger than Intel’s NUCs, but they integrate Intel’s 45W high-end mobile Core i5/i7 HQ-series Kaby Lake CPUs with NVIDIA’s mobile GeForce GTX 1060 3 GB GPUs, which make them capable of running VR games. The combination of size and hardware leads to pricing from $1465 to $1709. Shuttle was among the pioneers of modern small form-factor PCs for enthusiasts in the early 2000s. Back then, the company was the first to offer custom PC barebones that enabled users to build a PC without hassle on motherboard fitting and cooling. Shortly after, the company began to offer specialized versions of PC barebones designed for HTPC and gaming applications, essentially pioneering SFF gaming PCs. Shuttle was among the first PC makers who offered cube-sized (somewhere between ITX and mATX) PCs based on Intel’s X58 and X79, inventing a miniature enthusiast PC category (over two years before Falcon Northwest’s Tiki) and showing a new market for boutique PC makers, and eventually manufacturers of PC components. Intensified competition and other issues eventually forced Shuttle to focus on non-gaming specialized PCs and barebones for several years, but it looks like the company is plotting a comeback. Earlier this year Shuttle launched its SZ270R8 barebones, based on the Intel Z270 chipset and aimed it at the audience that buys Mini-ITX PCs. 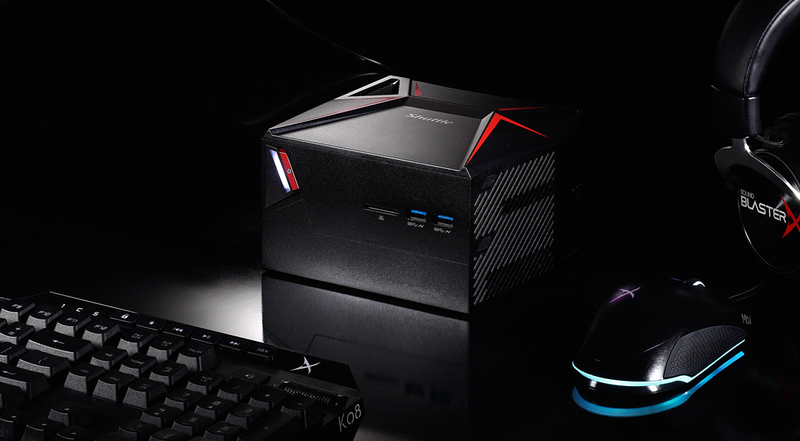 In June, the company formally announced the first member of the Gaming Nano family — the Shuttle X1, which is aimed at a slightly less crowded market of miniature gaming systems. The Shuttle X1 is an extremely small desktop PC that fits in a palm of a hand and resembles higher-end Intel NUC computers and competitors. Just like the NUC, the Shuttle X1 is based on Intel’s mobile CPUs, going up to 45W versions of the Core i5-7300HQ and Core i7-7700 HQ. But unlike Intel's NUCs, the X1 also carries an NVIDIA GeForce GTX 1060 3GB MXM GPU module. The systems are equipped with 8 GB or 16 GB of DDR4 memory operating in dual-channel mode. As for storage, the entry-level X1 has a 128 GB M.2 SSD and a 1 TB HDD, whereas the more advanced X1 PCs feature 256 GB M.2 drives without HDDs. When it comes to connectivity, the Shuttle X1 offer a rather typical set of I/O features, including 802.11ac Wi-Fi + Bluetooth, a GbE port, one USB 3.0 Type-C connector, four USB 3.0 Type-A headers (two on the front), four USB 2.0 ports, three HDMI outputs (one for a VR headset), one DisplayPort, one SD card reader as well as one 3.5-mm audio jack. Dual Channel 8 GB DDR4-? *For the GTX 1060, the desktop GPUs have different specifications for the 6GB (1280 cores) compared to the 3GB (1152 cores). The laptop versions of the GTX 1060 do not make this distinction - all the cards have 1280 cores, and there is no 1152 core variant for MXM. 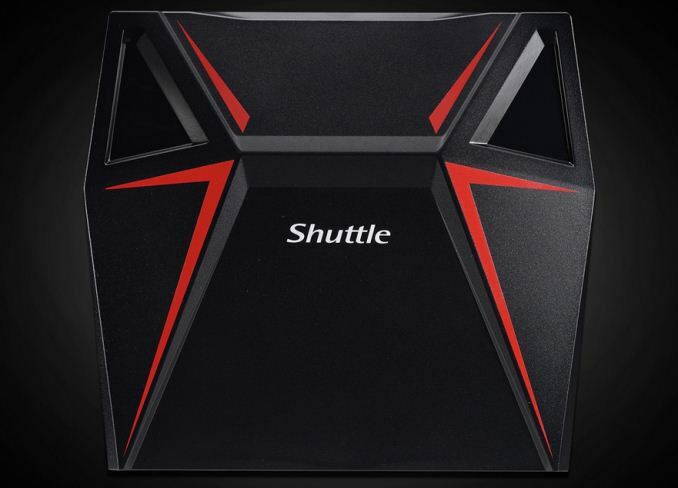 The Shuttle X1 chassis has a rather aggressive design with red elements and an unorthodox shape. A good thing about small dimensions is that the Shuttle X1 is easy to carry. A bad thing about the X1 is that it uses a number of custom components (chassis, motherboard, cooling, etc.) as well as mobile CPUs and GPUs, all of which are relatively expensive. As a result, the most affordable Shuttle X1 costs $1465 even with a discount, whereas the most advanced one is sold for $1709. All three Shuttle X1 systems are now available directly from the company and usually ship in one or two business days. To me this sounds like Frequency battle during the Pentium 4 days - does having more than 4 cores really help with todays software. 2. This is not from Intel, if they really wanted to make a Multi-Core box, they could use 18 Core monster.